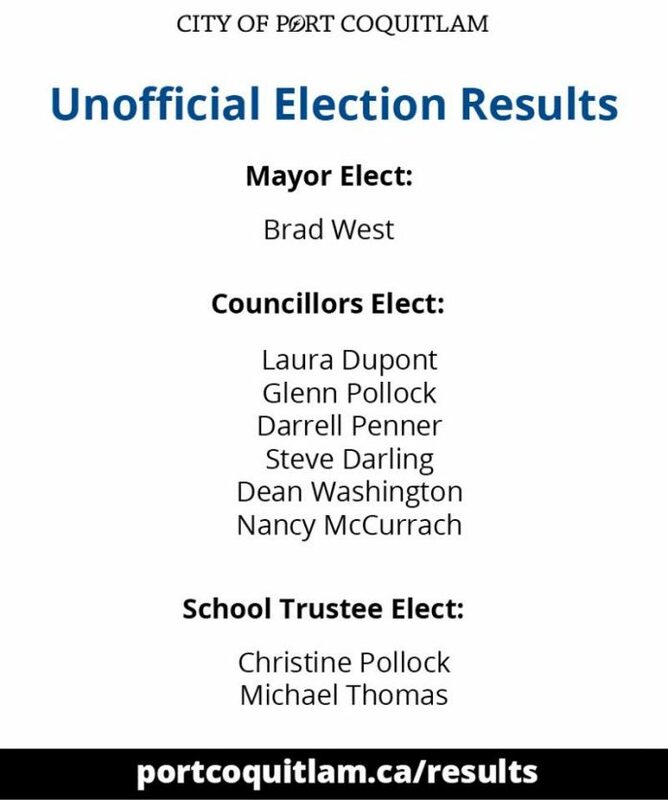 Port Coquitlam’s Chief Election Officer declares the City’s 2018 General Local Election unofficial results for the office of the mayor, councilors and school trustees. Brad West for the Office of the Mayor-Elect, for receiving the highest number of valid votes. Laura Dupont, Glenn Pollock, Darrell Penner, Steve Darling, Dean Washington and Nancy McCurrach for City Councillors-Elect for receiving the top six highest number of valid votes. Christine Pollock and Michael Thomas for School Trustees-Elect for receiving the top two highest number of valid votes. The Council inauguration will take place on Nov. 6 at 7pm at the Terry Fox Theatre, marking the first meeting of the new Council. The event is open for the public to attend. In total, 11,880 Port Coquitlam voters turned out Oct. 20 and at two advanced polls to elect a mayor, six councillors and two school trustees to represent their community for a four-year term. The number represents a voter turnout of approximately 29 per cent – a three percentage point increase from the 26 per cent turnout in 2014. The complete breakdown of votes by polling station is available on the City’s website at www.portcoquitlam.ca/election. The results will be made official following a final count. Poll by poll elections results at link.